Cozido or cocido is one of the traditional dishes of Portuguese and Spanish cuisine. A stew made with different meats and vegetables, numerous regional variations exist throughout Portugal and Spain. Left: "Cozido à portuguesa" (Portuguese stew) plate with its traditional rice and beans. The Portuguese cozido has its origins in the Beira region and is commonly referred to as Cozido à Portuguesa. 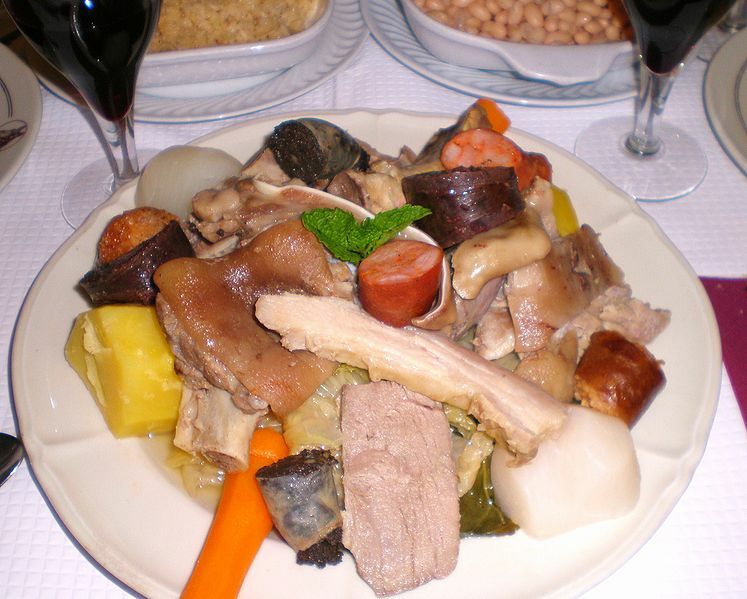 A rich stew made from shin of beef, pork, and, in some regions, chicken served with cabbage, carrots, turnips, Portuguese smoked sausages (morcela, farinheira and chouriço), rice, potatoes, and collard greens.